Land Clearing of Right of Way for Existing and New, Commercial Mowing, Hazardous and Dangerous Tree Trimming and Removal for Gas, Electric and Dept. of Transportation right of ways. Swartz Mowing Inc. currently offers service for Right of Way Clearing and Maintenance for Gas, Electric and Department of Transportation. Swartz Mowing also specializes in Storm Damage, Land Clearing, Hazardous & Dangerous Tree Removal, Stump Grinding and Land Reclaim. Swartz Mowing Inc. is an established right of way maintenance company located in Kentucky. We provide the right of way industry with quality service and the equipment and manpower to get jobs done under the toughest conditions. Line clearing/mowing, tree removal/canopy removal, and herbicide vegetation control are some of the services we provide. 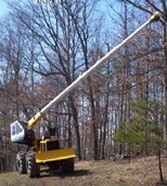 Please contact us today at (606) 674-2971.
to ask about our right-of-way maintenance services.